At the first stage the sounds are surging and thundering like the beating of kettle drums and jingling ones. At the intermediate stage they are like those produced by conch, mrdanga and bells etc. At the last stage the sounds resemble those from the tinklets, flute, vīṇā, bee etc. Sound is produced by the contact of two things, or say the hand and the drum in case of unlettered sound. Instruments floating are producing anāhata nāda as they are not beaten. 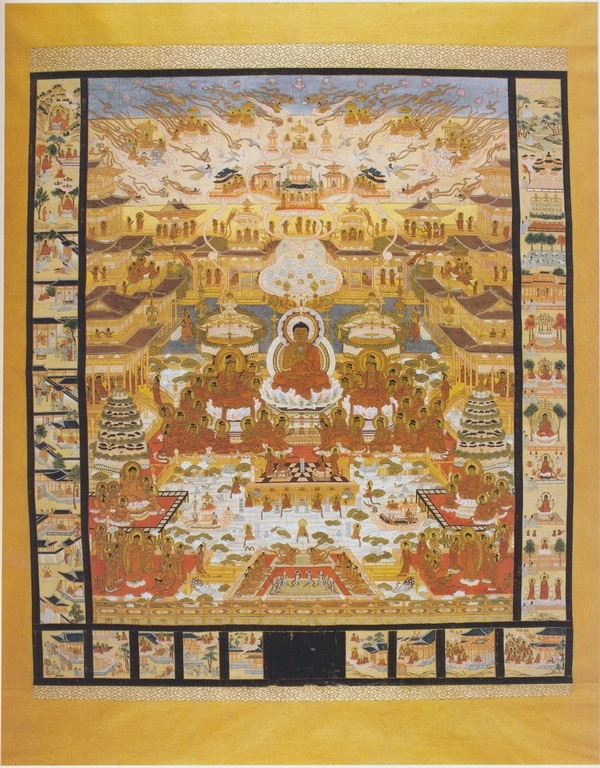 In the Central Sanctum of the Taima-mandala on crossing the five levels of concentration on the five elements, Vaidehī reaches the state of samādhi and visualizes herself and her husband to be present at various levels of palaces in Sukhāvatĩ. There, they are represented as Bodhisattvas, as enumerated in some versions of the Taima-mandala. Vaidehī transceds from rūpadhātu to arūpadhātu- from the world of beings to the world of imagination and realization. 1. Eight Great Bodhisattvas with Amitābha on both the sides of the court of dancers and musicians should be Vajrapāṇi, Avalokiteśvara, Ākāśagarbha, Samantabhadra, Maitreya, Maṅjuśrī, Sarvanīvaraṇa-viśkambhī, Kśitigarbha, as painted in a scroll kept at Kanchi-in, Toji monastery (TZ 106.1-8). All the Bodhisattvas are doing various mudras. Amitābha is standing on a huge lotus revered by the King and the Queen kneeling in front of him. Two tiny figures in the left corner are devotees bring offerings. Another figure walking to the court of Amitābha is also the king with a plate full of fruits or flowers. The same arrangement is there on the right side of the panel. 2. Above the first court is the second court, here Amitābha is sitting with six figures, five of them are doing mudras but one is kneeling with folded hands, this should be the King while on the opposite side, there is the Queen bringing offerings. 3. Above the second is the third court, represented by a double story building. The King is walking up the stairs and then he sits in front of Amitābha with folded hands inside the hall, where Amitābha is sitting with six Bodhisattvas. Two musicians are playing music on the upper story. The same court is painted on the opposite side but there the Queen is bringing offerings. 4. Above the third is another court, again with Amitābha and six Bodhisattvas and the King on the left and the Queen on the right side. This also looks like a double story structure, three Bodhisattvas are standing in front of it on both the sides while Amitābha is on the upper story. represented with shaven heads and without halos. A flying angel is painted coming down. Amitābha with the King and the Queen are there on both the sides. 6. The sixth building is painted to the inner side symbolizing a higher stage of meditation. Therein Amitābha stands with four Bodhisattvas. 7. The lower floor of the sixth structure leads to a corridor in which figures are shown walking towards the center. Finally at the center is Amitābha, attended by Avalokiteśvara to the right and Mahāsthāma-prāpta to the left. Both of them are attended by sixteen Bodhisattvas each. Two structures emerge out of the brahmarandhras of Avalokiteśvara and Māsthāmaprāpta, painted beyond the lower levels. Amitābha, the focal point of the mandala is sitting cross-legged on a huge lotus seat, the King and the Queen are praying in front, below them is the representation of the ninth degree of birth in his Paradise. They are standing, having a vision of themselves as reborn there sitting on lotus seats. Five gem trees, ratna vṛksas are painted on the right and the left at the back of the throne of Amitābha. A large number of buildings are painted in different levels forming a tower-like structure on the both the sides of the Paradise; they are topped by jewels like cintāmani encircled by halos or flames. Probably gems appear from the brahmarandhra of Amitābha, beyond that is Amitābha in a more subtle form, attended by the King and the Queen sitting with the two Bodhisattvas inside his palace flanked by two on both the sides. Beyond that is the final stage. Beyond this scene are Buddhas and Bodhisattvas flying down from the heaven from all the directions. In between are birds and musical instruments floating in air in the sky. Some flying goddesses are also painted. In all they should have been twenty – five as painted in Raigo scenes. Many Buddhas of all directions appear before the practitioner on attaining the state of samādhi, therefore seeing a Buddha came to be regarded as sign of attaining samādhi according to the Samādhi-sūtra (Ch. Pan-chou san-mei ching). Shan-tao wrote in his commentary, he could visualize Amitābha and his Paradise according to the method expounded in the Amitāyurdhyāna-sūtra (Senchakushu 1998: 199). In Sukhāvatīvyūha- mandala the Queen finally had a vision of the Buddhas and Bodhisattvas flying down from all the directions and that is the final stage of meditation.